Fionn MacCool's is found on the south end of the Holiday Inn on Gateway Boulevard. 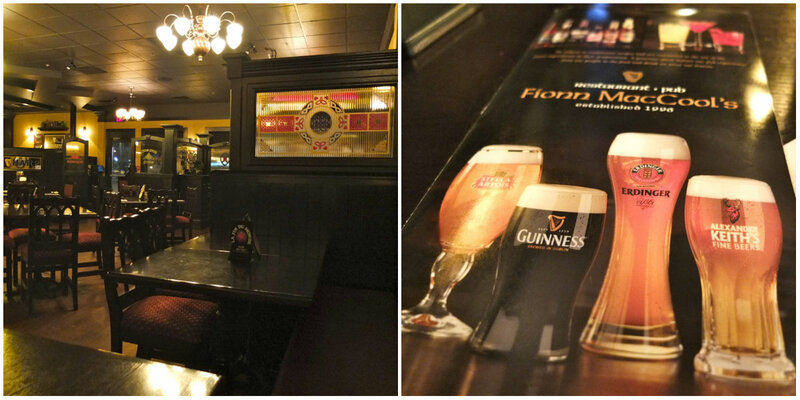 Opening in the spring of 2012, it is a part of the Prime Pubs chain of Irish-style pubs found across the country. The restaurant is decorated in dark wood with glass etched with beer company logos dividing sections. Classic rock hits waft through the atmosphere at a moderate volume. 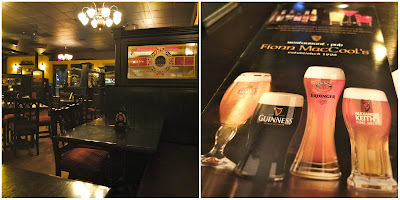 The establishment is divided into a dining room and a bar, with the elevation of the tables and proximity to the bar being the only differences I noted. Perhaps it's more lively on Fridays and Saturdays, but on my Sunday evening visit the spirit laid-back with many couples out for dinner, and hotel guests working on their laptops over beers. I started out with a Guinness, and an order of miniature yorkshire puddings. 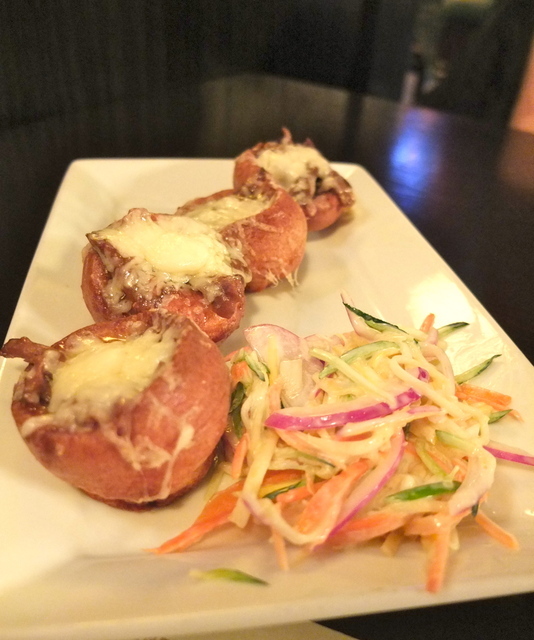 These were freshly baked, and stuffed with a tender beef short rib. It was braised with an unfortunately salty sauce that masked most of the Alexander Keith's IPA it reportedly contained. The haddock sandwich was the tasty combination of haddock, fried to a perfect crisp, topped with lobster and slaw. Accompanied by thick-cut fries, my guest was very satisfied with his entree. Though the kitchen initially forgot the asparagus spears for my salad, they arrived quickly after I enquired, and I enjoyed the dish, particularly the oniony zest of the Strongbow Cider dressing. 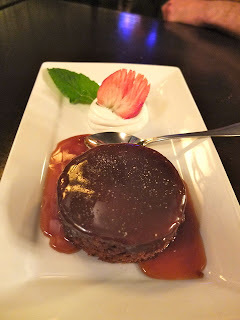 We visited on the eve of a menu change, and were able to have a sneak preview of their new spice cake dessert. Warm, covered in caramel, and with a tangy cream cheese consort, I'm confident this will be a popular new item. My guest and I enjoyed our selections that evening, and both of us saw several menu items we'd like to try at future visits. The service was attentive, and I appreciated the easygoing atmosphere and fairly low noise level for our casual dinner. 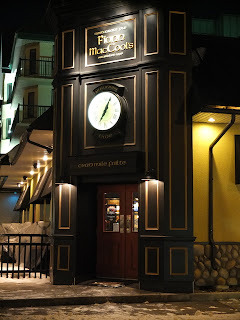 For hearty, comforting food in a decent North American interpretation of an Irish Pub, Fionn MacCool's is worth a visit if you're in the area. Just there tonight for the first time as a friend was staying at the hotel, seemed more classy than I had thought. Overall service was great and food was quite nice. Probably be back again as there was some decent menu items I wouldn't mind trying. This is not a huge place and I ate there twice during my recent stay. The food was good, but a bit slow in coming to the table. The noise from the band (including drums!!) was absolutely horrible: waaaaayyyy too loud and really in your face as the pub is too small to have this type of live entertainment. We could not even have a dinner conversation due to the volume, and the waitress completely dismissed our comments about the volume. She could not even hear us complain so we had to yell at her so she could hear our comments!! Hello!! Something wrong with this picture?!! The folks at the table near us also complained about the noise/volume.